If you're not in NYC, Boston or San Francisco or a handful of other major cities you may not yet be familiar with ZipCar. ZipCar was founded in Boston and offers "car sharing," which is increasingly becoming a legitimate alternative to car rentals in many major cities. 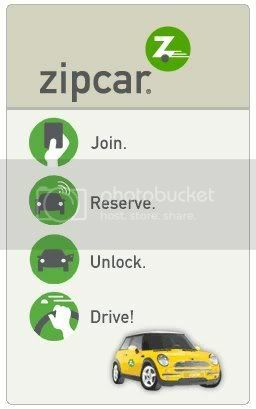 ZipCar seeks to be the antithesis to car renting and offers a lot of unique customer delights, sort of like Jet Blue. Instead of in-flight TV though, you'll get EZ pass, pre-paid gas and a selection of sleek of gas-conserving cars. ZipCar definitely has a cool factor and they're fueling it through events, guerilla marketing and WOM campaigns that get people talking about their unique value prop. For instance, last month ZipCar teamed up with Live Green and the Coalition for Smarter Growth for a promotion called "Green Confessions" which allowed customers in select cities to confess their "green sins" and relieve the guilt by referring friends to Zipcar, signing up for Live Green, or making a donation to CSG. In addition to guilt reduction, free drinks, and free munchies, drivers get a $50 credit for each friend who signs up for Zipcar. The WOM strategy is even infused in the cars themselves, after all seeing a yellow mini with a green Z on it is not an everyday sight. "We are very much a local brand marketer; in terms of what we do, we are really building relationships with local business, events, viral marketing. That's how we grew to where we are, by being feet-on-the-street and out in the neighborhood. We have added in things like online and other marketing vehicles, but as we grow, we will maintain what works, which is hyper-local marketing, and continue to rely on word-of-mouth." Godfrey goes on to state in a January Ad Age piece that "car-sharing is a category that is relatively young and there is tremendous opportunity for further penetration for the cities that we are in, and there are incremental cities to go in." If you've got a "green" angle to your event and buzz worthy activation concept, you might want to keep an eye out to see if ZipCar's coming to your city. More about ZipCar: Zipcar is the world's leading car sharing service with more than 200,000 members and 5,000 vehicles in urban areas and college campuses throughout 26 North American states and provinces as well as in London, England. As a leader in urban transportation, Zipcar offers more than 30 makes and models of self-service vehicles by the hour or day to savvy city residents and businesses looking for an alternative to the high costs and hassles of owning a car in the city. For more information, visit Zipcar.com.